Welcome to Pack 90 of Forest Hills, PA! Cub Scouting is a year-round family program for boys in the 1st through 5th grades. The program emphasizes shared leadership, learning about the community, family understanding, character development, citizenship training, and personal fitness. 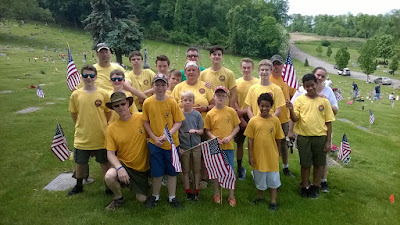 Flags for Memorial Day Thanks everyone that came out to place flags at the Braddock Cemetery this evening. We had a great showing and it was a wonderful event to take part in. I hope everyone has a great Memorial Day weekend and don't forget to take a moment to teach your son that the day is about more than just a cookout. St Patrick’s Day Parade Michael F. Doyle, U.S. Representative for Pennsylvania's 14th congressional district invited Pack 90 to march with him in the 2018 Pittsburgh St Patrick’s Day Parade. Despite cold weather, turnout was great. Scouts met at 9:30 to prepare for the 10AM start. The route covered about two miles of Pittsburgh streets. The scouts met many smiling and enthusiastic St Paddy’s celebrators.Thanks to Representative Doyle for the invitation and for all the parents who braved the weather to help the scouts celebrate this festive holiday. Winter Camp We had 72 Scouts and parents enjoy Winter Camp at Heritage Reservation on Feb. 16-18. We even had SNOW late in the day on Saturday! Scouts enjoyed archery, slingshots, broomball, obstacle course, Frisbee golf, and more! Our skits at the campfire were superb too. Winter camp is all about spending time with your son playing games and just hanging out together. Can't wait til next year! Pinewood Derby We had a great Pinewood Derby on Saturday, January 27! Our Scouts did a wonderful job of designing and racing such creative cars. Well done boys! And congratulations to our Derby winner Ascher Holleran for building and racing the fastest car. He's our Pack Champion for 2018! Our "Friends of Pack 90" race on Friday night also produced a winner so congratulations Mr. Brian Sinciline for racing the fastest "friends" car. Interested in Joining Pack 90? From September thru April, our Tigers, Wolves and Bears (1st-3rd graders) meet on the 2nd and 4th Thursday's of the month while our Webelos and Arrow of Light Scouts meet on the 1st and 3rd Thursdays. Meetings are held from 7-8 PM at the Forest Hills Presbyterian Church (FHPC). We’d love to talk with you and your son about Scouting! Please contact our Cubmaster, Adam Pitler at cubmaster90@gmail.com.